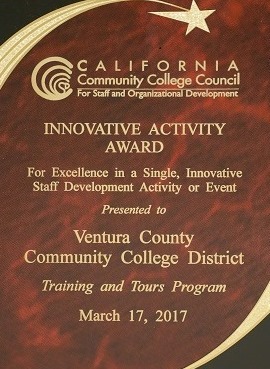 The VCCCD Training & Tours program received the 2017 California Community College Council for Staff and Organizational Development (4C/SD) Innovative Activity Award, recognizing excellence in a single, innovative staff development activity or event. Training & Tours was developed in response to the classified staff's desire to work collaboratively with colleagues in similar departments across the District's four sites and to have opportunities to interact in person with colleagues beyond one’s own work site. Launched in spring 2016, Training & Tours provides opportunities for classified staff to engage in half- and full-day training activities on specific topics like budget management and requisition processing, followed by short walking tours of the work sites. Sessions include small group discussions for sharing best practices and ideas on the presentation topic. Training & Tours events are scheduled three times per year and held on a rotating basis at the four District locations. The program promotes a unified and collaborative approach to professional development and recognition for classified employees.